Pours an opaque medium straw producing slightly more than 1+ finger of finely bubbled, foamy, white head that leaves minimal but streaky lace. Aroma is thin banana, clove and yeast. Taste is wheat, yeasty clove & banana & a nice, spicy pepper bite from mid-sip that does not fade until well into the aftertaste. Finish has an ashy-mineral taste. Mouthfeel is light-medium bodied with high carbonation, crisp & sharp with pepper spice but smooth & drinkable. 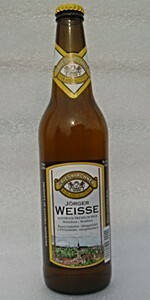 This is more like a Witbier than a Hefeweizen. Good but not great. A: The beer is slightly hazy pale yellow in color and has a moderate amount of visible carbonation. It poured with a quarter finger high white head that died down, leaving some specks of bubbles on the surface and a narrow collar around the edge of the glass. S: Moderate aromas of bananas are present in the nose along with some hints of cloves. T: The taste follows the smell, having lots of flavors of bananas with notes of wheat and hints of cloves. O: This hefeweizen has a strong dose of bananas in both the smell and taste. It's a good representation of the style. Poured from 11.2 green bottle into a tulip, minimal head no lacing. Looks pale hay colored yellow in the glass. Opaque with a good bit of yeast still in suspension. Smells mainly of esters, clove, banana and a little fruitiness. Taste initially of banana with the clove coming up in the middle with a slight fruity finish with a touch of spice. Finish is not overly dry and the beer has a pretty nice mouthfeel. A 16.9 ounce Euro bomber poured into a shaker pint glass (I don't own any of those cool hefeweizen glasses). Appearance - A light yellow color. Hazy. A nice head but it disappears quickly. No lacing to speak of. It looks like an unfiltered apple cider. Smell - Citrus. Sour. Bubblegum. Taste - Lemon. Somewhat sour. Bananas. A bit tart. Interesting. Mouth - A bit fizzy. A little weak. Overall - This is a good, but not great, European hefeweizen. The citrus/lemon flavor and the mild sour taste, on the back-end, are nicely balanced. I'm guessing that the tart flavor, in the background, is the result of the hops. The ale works well enough but, to my taste, it is a touch underwhelming. Sampled two days ago on 5/19/15. Comes in a 500ml (16.9 ounce) ounce bottle that I picked up for just $1.00 last month at the Hy-Vee next door in Council Bluffs, Iowa. Bottle chilled down to 36 degrees F in my beer cooler and poured in to a handled-glass "CHEERS-BOSTON" stein. Brew pours a hazy apricot-amber in color with a thin white head. Some spotty lacing was seen when sipped. The aroma is pretty much the typical aroma of this style of brew with some spices and wheat. The taste is close to the nose with some bananas, clove and pepper along with the sweet wheat. Decent finish overall. Not as good as some others I tried of this style but decent. Close to Medium-bodied with perfect carbonation. On tap at the Map Room. Pours cloudy yellow with a white head--pretty standard for the style. Smells of bananas, black peppers, and cloves. Nice profile, with the sweetness of the fruit balanced by wheatmalt spice. Tastes, thankfully, like it smells: big nanners, black pepper. Flavors aren't quite as intense as the aroma led me to anticipate, but the palate is still nicely composed. Not all that much to say, here. A very nice but somewhat lightly flavored hefe.